As writers we want to make our books unique. As unique as we can. We all know there are just so many plots. We often use romance tropes and they’ve all been done before, so we use our experiences and individuality to make them our own. In a novel I’m working on, (which I must say I’m working on 3 right now!) I have a situation where I need my two people stuck together for a while. The story is set in the winter and my first thought was to start foreshadowing bad weather. They were going to be stuck in because of a snow/ice storm. I hadn’t even typed the first letter before I stopped. First off, I wrote a story in the last couple of years where that happened. Second, I’m not sure how many other stories have had that happen, but I’m sure it’s a few. So, I started thinking. I call this my Donald Maas method of thinking my way through plot points because he talks about this in his Writing the Breakout Novel book. I started listing the ways and means my characters could be stuck together. When you reach the tenth one, Donald says to explore that option-it probably hasn’t been done as much as the first one you listed. So I did. I now have a way to accomplish what I wanted with my characters. And hopefully it’s done in a different way. But I’m curious as to what you think. I’m going to list my ten options in the order I wrote them. I’d like to hear which one you would like to read about. I’ll add that while they are stuck, there are other people there as well. They aren’t going to be alone overnight. I do love the writing process. The ability to take two people who are at odds and write their love story. Love is beautiful and I’m thrilled to be a part of creating it. 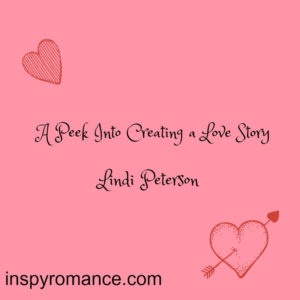 Hi Lindi, I am glad you enjoy crafting stories because I certainly enjoy reading them:) What a cool idea to come up with ideas/scenarios. Hi Lindi. Thanks for sharing your writing process and for the survey. I found it difficult to vote because I do not know the setting of your story – city and state. I presume it is a northern state. There are many kinds of homeless shelters – some are for families or abused women or in Chicago in the 1980s many were for men (alcoholics and vets – as a pastor’s wife in the winter in the early 1980s I fed my share and my husband helped them find shelters). I think that often romance writers use snow storms and many of the scenarios on the survey because the writer can still have a “happily ever after” ending. If the couple is forced to stay together in an hurricane or tornado or even a protest or lock in the outcome may not be positive. Hallmark has done a movie, where a bear and closed roads, kept a couple together. Another Hallmark movie a couple is locked in during a hurricane. Hallmark also has several movies about a dare. So the only ones I haven’t seen or read about is the protest or lock in. Just finished reading Yukon Yuletide: A River’s End Ranch Christmas romance were the couple was locked in due to a broken down snow mobile and blizzard. Best wishes. Hope we readers can help. Enjoy your summer. Renate—A big thank you for all your insight!! I appreciate your comments and input. I’m working the story two ways for now. It’s actually in the south in the winter, but it’s an extremely cold one—not the usual 40’s and 30’s. Hey, Lindi!! I chose the protests since I have read almost every other choice at one time or another. I did like the hurt animal one as well and almost chose that, but I think protests might be really interesting and could go many different directions! Paula Marie–thank you for your encouragement. The hurt animal one could go different ways, and I’m not sure I could write that without tears. :) Looking into the protest one. It is different. Interesting way of brainstorming ideas when you’re feeling stuck in one spot. Feels like it could be useful outside of writing too. Amy J—For sure!! I agree. All different areas can benefit from our taking our ideas and thoughts to a deeper level. Thank you for talking about that. This is a great way of coming up with new ideas. It definitely gets the brain into critical thinking mode and forces you to push past the obvious choice. I chose the contest, or dare because it could be fun and I’ve never read a scenario like it before. I’m looking forward to seeing how it all works out. I think the contest and /or dare idea sounds like it could be a lot of fun!! They do!! I’m not sure the story is lending itself to that, but I’m keep options open and listening to these characters. I can see my girl being a part of a contest or a dare, not sure about my hero. But, you never know. :) And I do like to write fun. I started that book. How to books tend to paralyze my brain. So I never finished it. Since then I’ve learned to read a little at a time and that way it’s not overwhelming. The ten ideas is a great concept, so I’m glad you read it :) I’ll have to remember that. I like the one that the car won’t start, but the hero can’t fix it. In most stories the hero DOES fix it, so this is a different twist. It will be fun to read the book, and see what you decide. Interesting ideas there on your poll/quiz. For other ideas of why they feel the need to be in a homeless shelter is that they were volunteers, they met there and still have not found a place to live and or they are wanting to help expand services for the homeless.